"I've been using your Accelerating Metronome to practice the drums for about a year now, and it's the most helpful practice tool I've used in ten years of playing." "Awesome. Tempo changes can really ground the conscious mind in a greater depth of concentration." "I like The Accelerating Metronome a lot, it worked really well." However, some Vista and 7 computers have trouble with sound-related applications. Therefore, Please download and try the TRIAL version before buying the Full version. 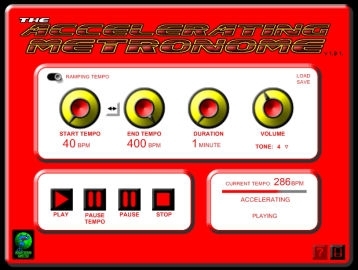 The Accelerating Metronome alleviates the tedium of having to manually adjust the tempo setting while practicing to a metronome. The user specifies the Start Tempo and the End Tempo, and the Duration of the acceleration period. 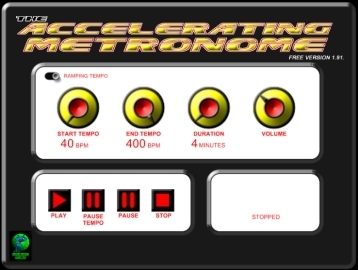 The Accelerating Metronome smoothly and automatically changes tempo according to the user’s input. The on-screen controls are very simple to use; most functions can also be triggered by the keys on your computer keyboard (hotkeys). The metronome can also provide a constant tempo, like a traditional metronome. Price: $15 CDN thru PayPal. The 30-Day TRIAL version of The Accelerating Metronome is fully functional for 30 days, after which all functions are disabled. It is strongly recommended that you evaluate this trial version before buying the full version. The User's Guide is automatically installed along with any version (FULL, TRIAL, or FREE) of the Accelerating Metronome; however, you may also download the User's Guide separately.